Reflect upon your present blessings – of which every man has many – not on your past misfortunes, of which all men have some. Here is my photo essay on reflection…I hope we all take time to reflect on all our blessings…. For 30+ years, Radeen and I have been going back to school each year with excitement and also with normal educational challenges. Also for 30+ years, we have been planning and dreaming of the day when we could simply stay on the boat. For example, we watched the most beautiful sunset last night for well over 30 minutes. When do you every watch a full sunset while you are working? We enjoyed a glass of wine in the cockpit as Radeen and I talked at length about our great summer sail to Maine. It is hard to make quality time to truly talk with your spouse and reflect while you both are busy working. We enjoyed the sea birds that were blown inland 50+ miles from the hurricane. They seemed lost, looking for the ocean beaches. It can be difficult to make time to watch birds while working.Why? Because you are too busy, too rushed, with no time for these little things in life. Now we do have time and we are taking the time to enjoy these simple treasures. So as we truly begin our new adventure, we close one chapter of life today and look forward to the cruising life aboard Island Spirit. What a great way to end a summer….life aboard is a dream and we know we are so fortunate! Here are some photos to demonstrate the peacefulness…. One of my new students…look at how well he can focus and pay attention! This student I can tell will be trouble…notice the look… the attitude…oh, boy! Is this bad boy paying attention? Not really….I know how to read my students! Reflections on your past, present, and future dreams is a worthwhile activity. Take time to reflect and plan! Our current classroom, notice the open feeling of this room….ahhhh. This is a September sunset, I have watched this for 20 years. now….it is time to prepare for points south and the BAHAMAS! There it goes…sunset on our teaching careers…. Radeen…who loves to sail….and live on the our boat…. 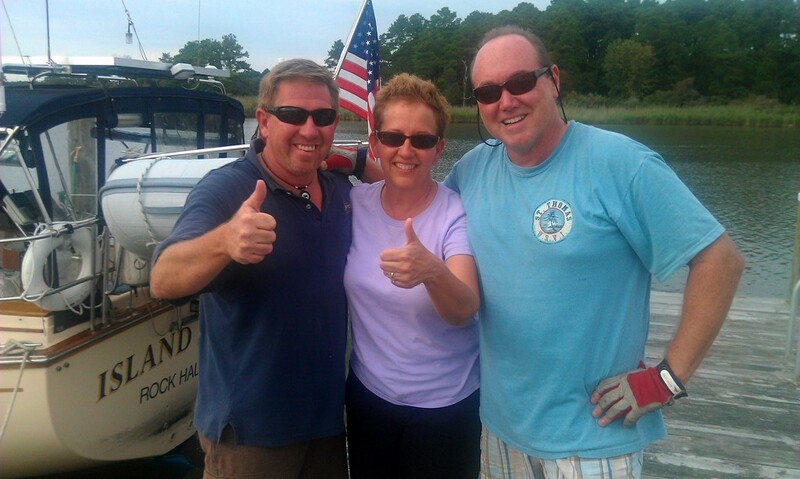 WE SURVIVED….and our boat, ISLAND SPIRIT, survived at our home dock, with nearly zero damages! This is the second hurricane she rode out in this slip. We feel so fortunate, yet we are deeply worried about our friends in the Long Island and New England areas as IRENE is headed directly towards them. Our push home from Block Island, RI, started on Tuesday, Aug 23rd, arriving in Cape May, NJ Wednesday, Aug 24th. We took a lay day Thursday, Aug 25th as a front was passing, and then in the calm before the storm we ran 100 miles from CMNJ to Rock Hall, MD getting into our home dock Aug 26 at 1600hrs! That was a record run of 13hrs and 30 minutes from dock to dock with speeds of 7.2+ knots all the way. Big thanks to Bobby W. our route planner who uses Noble Tech software which calculates route and boat speed to project the best run time. That is why we left CMNJ at 2am and ran the canal in the dark, which is a challenge with the railroad bridge and no lights. Then we entered the Delaware Bay at 3am and 13.5 hrs later, we were home! 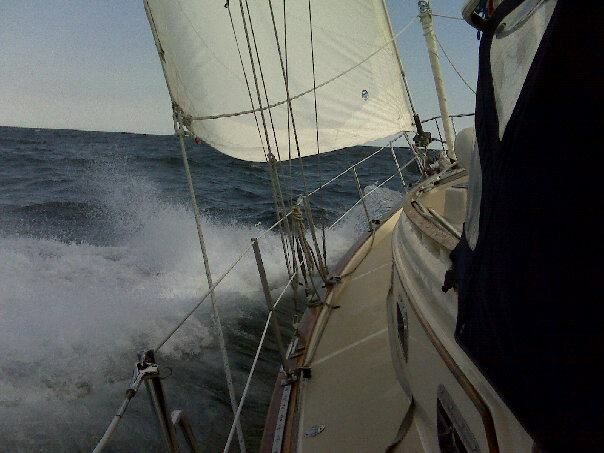 Underway during the run for home, we removed the jib and staysail and extra gear. We hit the dock and in 4 hours we had the boat totally stripped of all topside gear. Saturday, we got up at 5AM, removed the 10′ dinghy, outboard, fuel tank and all related gear. Taking the dinghy to land, we tied it to the largest tree we could find on high land, ready to be used a support boat if needed. We added the motor to the dinghy on land and filled up the fuel tank and spare tank with gas. By 8am, Sat Aug 27th, we were packed and moving off the boat into our car. We went out for breakfast and then we returned to the boat for one final inspection of the 14 different dock lines we had tied to the boat. The winds were picking up and we had done all we could to protect Island Spirit; it was time to leave. It felt so sad to leave her, and to let her fend for herself as she would be fighting for her life against the ENE winds of 65 knots. So, off to the Comfort Inn Suites in Chestertown, MD, where we enjoyed a nice afternoon at the Mexican Restaurant, an afternoon at the Harbor Shack and then we wrapped up the night at Oconner’s Irish Pub. When we returned to the Comfort INN, we had about 1 hour to move into our room until the power went out. We used our cell phones and flashlights to get around and then we called it a night, knowing that we would be up early to check on the damages. Sunday, Aug 28th, Cap’n Blaine and Jeff headed in at daybreak for our first reports of damages. We had received a comforting text from Dave H. that all was fine, no damages were taken on Island Spirit and the marina was holding together. We packed up the rooms and re-loaded the car so we could move back onto the boat. The winds were still blowing 40 knots with gust to 50, but with West winds, these were directly on the our bow. The boat was so well protected that we moved back on and made eggs and ham wraps for 5 for breakfast. At the present time, Sun 12 noon, the storm is abating and the winds are now down to 20-30 knots. This storm has one word that I use to describe her….E P I C….that is what it has been, truly epic in size, intensity, duration and power. We are fortunate to have fared so well, we hope everyone is as lucky! Here are photos to show the progression. We kept having this PIRATE Cap’n Blaine with us everywhere…!!!! Thank Goodness we did, the extra watch really makes it nice. Thank you, Blaine! We always celebrate our return from New England at Utsch’s Marina. Flat Calm Delaware Bay, we ran at 3AM, making it up the bay in a record 6.5 hours! Prep for hurricane begins as we enter the Chesapeake Bay. Sails off and main sail wrapped before we hit the home dock. I will NOT let him off the boat until we reach Rock Hall, MD! All sails, dodger, bimini, cushions, lines, and halyards stored below. Island Spirit with the full enclosure canvas gone. The Bimini roof canvas gone…and the frame secured with heavy lines. The dodger windshield was removed and the frame folded down. The stack pack and main sail were wrapped tight and reduced to minimum windage. Electronics were covered and taped with duct tape. The helm electronics were covered and tied. The helm seat was taped down, as well as the lockers. The hawse pipe and chain openings were taped and sealed. This is how she looked all stripped down…. Success….Team Island Spirit Arrives back in Rock Hall, MD! 18 hours before Hurricane Irene was due to hit ! Thank you Cap’n Blaine for connecting with us in Block Island, RI and remaining on board as we pressed on to home. Tomorrow, Monday, we will run Blaine to the BWI airport when he will jump a flight to home…. This storm will be massive and we have been looking at this weather for over a week, that is why we have been running for the Chesapeake Bay. We departed Block Island, RI on Tue for a direct run to Cape May, NJ. We then took a lay day in CMNJ. Today, we ran at 2am from Cape May NJ for the Chesapeake Bay 100 miles! We are now nearing the Chesapeake and should be HOME by 3PM today. This will give us time to decide on how much to strip off the boat and to secure her in a nice wide slip at our marina. Then when the storm hits Sat PM we will be off the boat in a hotel room since the winds will be 40-50 knots all night sat pm. THE AFTERNOON. PATCHY FOG IN THE MORNING. VSBY 1 TO 3 NM. MIDNIGHT. SEAS AROUND 9 FT…BUILDING TO 13 FT AFTER MIDNIGHT. LIKELY WITH A CHANCE OF TSTMS IN THE AFTERNOON. VSBY 1 NM OR LESS. TSTMS IN THE EVENING. SHOWERS. VSBY 1 NM OR LESS. DIMINISHING TO 20 TO 25 KT WITH GUSTS TO 35 KT IN THE AFTERNOON. It has been a long hard push, but we will soon be home and we feel that the Chesapeake Bay is more protected than New England. Our issue will be dealing with floods and high tides, especially since we will now be off the boat. Island Spirit has taken such good care of us we hope to do the same for her…. 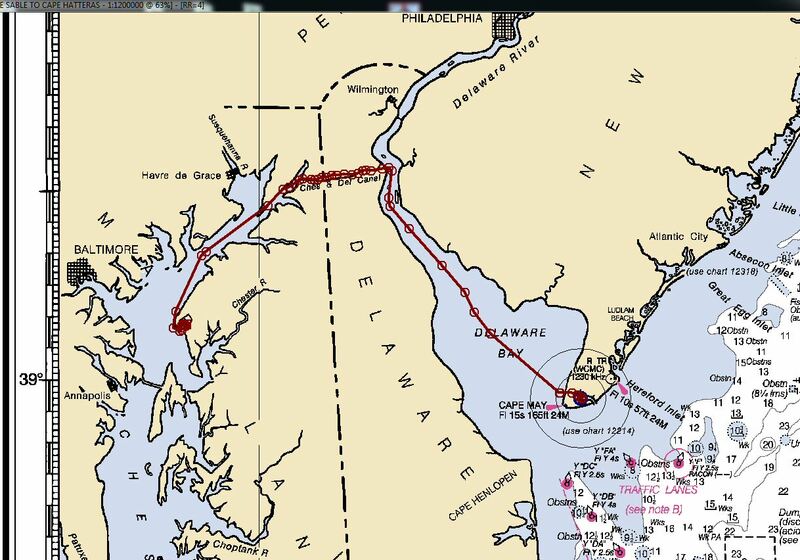 We are currently running the Delaware Bay from Cape May NJ to the C&D Canal where we will then run down the Chesapeake Bay to our home port of Rock Hall, MD where we will dock. Tonight we will strip the boat of all sails, canvas, dinghy, and tie up with extra dock lines and spring lines. We have booked a room for Sat PM to move off the boat as the winds will be so high that the boat will be rocking and bouncing so much that it could be dangerous, plus during a storm like this, there will come a time, if you are on the boat, that you will NOT be able to get off. That is very dangerous….so we will move off to land. We hope everyone fairs well in this EPIC storm! Here is the forecast for today and Sat at our home dock. AND TSTMS IN THE EVENING. THE AFTERNOON. VSBY 1 NM OR LESS. In all, we were very happy that we love to sail close hauled and that we can sail up to a setting of 38 degrees on the B&G wind machine! So we had to take one starboard tack to go offshore at Wildwood, then one final port tack to the inlet where we could beam reach in the Cape May Inlet. NOW….we will run for Rock Hall, MD tonight at 0200hrs, as we wait here in NJ for this next front to pass today. Friday, it is to be calm and we will run the full 100 miles for home where we will then ride out the hurricane in Rock Hall, MD. Our plans were…..to spend a week here at CMNJ but…..that is not going to happen. After a day at Block Island and a connection with our good sailing friend Blaine Parks, we three departed Block Island at 0530hrs for a direct run for Cape May NJ, CM NJ. We should arrive CMNJ Wed around 4-6pm if the winds and seas are nice to us. Once there, we will take a rest day and beach day at Utches Marina and then run the Delaware Bay for the C&D to our home town of Rock Hall, MD. The run from Block to CMNJ is 204 miles on a course of 240 degrees. That is South West SW and the winds here are usually SW, but today they were NW at 15 and now they are W at 5-10, so the seas are flat and we are motorsailing at 6 knots. The forecast is for backing winds to SOUTH and building 10-15, the issue will be when and then as Wed night approaches they will build to 15 with gust to 20 and the seas will come up. So, we are pushing to get into CMNJ before this builds, but it is all a matter of timing and we can only run at 6 knots. We can sail at 7 knots but need 15-20 knots and NOT SW winds. Then on Sat/Sun we have hurricane IRENE to deal with and we plan to get out of CMNJ running north to the Chesapeake Bay where we should be protected. This storm looks very serious and we have been very active on monitoring the development. Photos and more to follow….we are currently 10 miles south of Montauk Point, NJ. We have had some great fun along the way! McSeagull’s was the place for dinner in Boothbay with Eric & Pat from IP-460 Cutter Loose and Bob, Kathy & 3 adorable daughters of IP-380 Drake’s Passage. 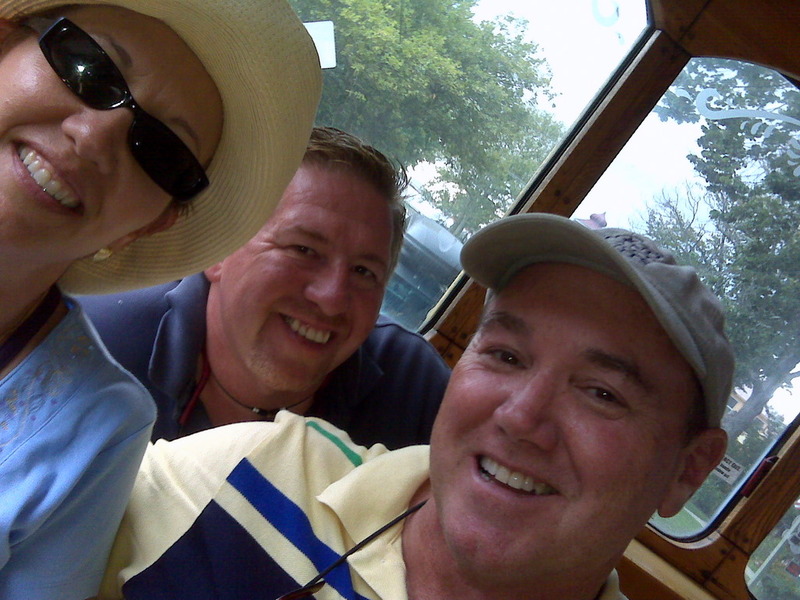 Next, we had a delightful and delicious evening with Bernie and Eileen aboard IP-40 Top Cat in Vineyard Haven. And here in Block, we have had beach adventures and dinner at the Narragansett with the team of IP-380 Drake’s Passage. We are so fortunate to have a moveable neighborhood of IP friends out here! Now we are on anchor in Block Island and we would like to be in Cape May NJ by Saturday! We have a major front to deal with and then maybe a weather window to make the 220 mile ocean run on Tue/Wed. Lucky for us, we have a great friend, Blaine Parks, arriving here in Block for a visit and he will sail with us back to NJ. This will make it much easier as with three onboard, the night watches are less tiring. So, we wait in Block Island for a weather window to run for NJ and we are also keeping a keen eye on tropical storm IRENE…. The ferry arriving Vineyard Haven off our starboard side at anchor. What a great town, we need to revisit this and spend a summer here! Ahhhhh…..Block Island North Lighthouse, a great view when sailing in from the North. Welcome to Block Island, the entrance is narrow with people on the beach. The cut is easy, straight, and short, then you enter the GREAT SALT POND and drop anchor. Our welcome back sunset over the Coast Guard Station….thank you, Block Island ! One word….MAINE….that is all I can say! Sadly we are now in Gloucester Mass, and I am trying to catch up on the blog, so for me, being a visual learner, the best way is with photos. In the past month I have taken over 3,000 digital photos and most of them only turn out half as good as it really looked. So here are a few from my MAINE collection….enjoy…. We are still here….still afloat….but have NOT blogged in a week! We are lost in the beauty of Maine from NE Harbor through Deer Island into Hell’s half Acre and then onto Vinalhaven and then into Camden where we waited out the 30 knot blow last night. Today, we are underway again, motorsailing the 45 miles from Camden Maine west to Boothbay Harbor. We hope to catch up with the blog soon with more photos….but for now, we are under way….